Beans grow in a wide range of cultivars and varieties, with bush, pole and half-runner varieties and snap, shelling and dry beans. 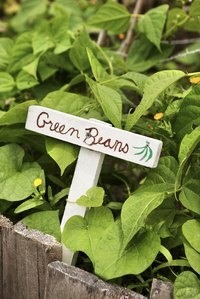 All bean plants need the same basic conditions for growth: warm, frost-free weather, bright sun, friable soil and consistent moisture. Peruano bush beans from Mexico and South America are no different. These summertime plants produce thin-skinned yellow beans with dense flesh for cooking and canning. Plant peruano beans in spring and maintain them through summer for the dry bean harvest. Clear grass and weeds from a wide, flat site that receives at least eight hours of full sun every day and has good air movement. The plants need sun and air for growth and wind and insect activity for pollination. Prepare fertile, friable and quick-draining soil for the best bean harvest. Turn 4 to 5 inches of organic compost and garden loam into the top 8 inches of soil in your chosen site. If the soil is still thick or tight, add 2 more inches of amendment. Beans suffocate in tight or poor soil. Turn 5-10-10 fertilizer into the top 6 inches of soil at a rate of 1 cup per 50 feet of row. Sow peruano bean seeds 1 inch deep every 4 to 6 inches in the row, with 3 feet of space between rows for growing and gardening. Start peruano beans in mid-spring after the last frost of the season. Bean seeds cannot germinate at soil or air temperatures under 50 degrees F. Don't delay the start date for these beans, which require a long growing season. Water in the entire patch of newly sown bean seeds with 2 inches of water. Spread 2 inches of organic mulch on the soil between plantings. Mulch minimizes weed growth and maximizes soil moisture. It also keeps disease-bearing soil from splashing up onto the plants during watering. Water the bean seedlings after they emerge with 2 inches of water every week to maintain consistent moisture. Bean plants fail in dry conditions. Thin seedlings to 1 foot apart. Fertilize the beans at mid-season with nitrogen-heavy 12-12-12 fertilizer for better pod formation. Harvest peruano beans with other dry beans at the end of the season. Allow the pods to dry on the vine, along with their seeds. Shake pods to listen for dried seeds inside before harvest. Cut the pods from the plants to avoid pulling at and damaging the plants themselves. However, don't expect second harvests from dry bean plants. Peruano beans are also know as canario, mayocoba or azufrado beans.